History, Dutch and Art subjects all in one magazine. Second year high school students at the Liberal-Christian Lyceum High school in the Hague, Netherlands, combined three subjects into one project. They created a magazine called ‘The Golden Age Project’. Their history teacher, Mirjam Zeilmaker, coordinated the project. The students created the magazine over the course of 6 weeks. Mirjam created a step-by-step guide book containing all the information the students would need to complete their magazine. So not only are the students completing exercises pertaining to each subject, they are also learning how to plan accordingly. The magazine was graded on content for History, spelling and grammar for Dutch, and design and creativity for Art. For Dutch class, the students had to read a book from a book list and write a book report. They also wrote a letter, consisting of at least 300 words, to the book publisher. Students were allowed to read the chosen book during the first ten minutes of every History and Dutch class leading up to the assignment deadline. For History they created a project that combined historical events with people in present day Netherlands. Michiel Adriaenszoon de Ruyter was a Dutch admiral. He was one of the most skilled admirals in history, most famous for his role in the Anglo-Dutch Wars of the 17th century. His descendant Frits de Ruyter, currently lives in The Hague, so the school simply got him to visit for a day. He gave the students a presentation about his forefather and his family history. A few of the students were tasked with organizing this event themselves. A few other History assignments included seeing a historical movie, visiting a museum, writing a review about both, and adding a recipe for a dish from the Golden Age. A magazine project wouldn’t be complete without creativity and design elements. The students got to work on the magazine cover during Art class. Another assignment for Art was to recreate a historical painting using themselves, classmates, family and/or friends. Jilster allows you to experiment with different elements on a page. You can decide right away to keep what you’ve created or edit it. If you don’t like the way something looks you can easily try something different. 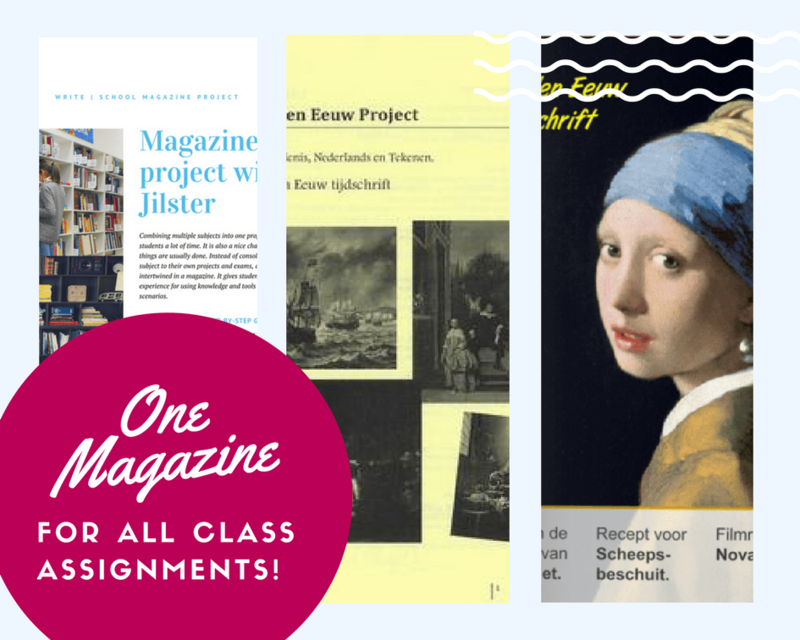 Mirjam witnessed this happening first hand when her students started working on their magazines. “The search was on to find the right file types, images, and backgrounds to get the ‘look’ they wanted in their own magazines. At times it seemed like a text box would disappear under some layers. This was frustrating, but having to manage all the elements on a page was good practice for the students.